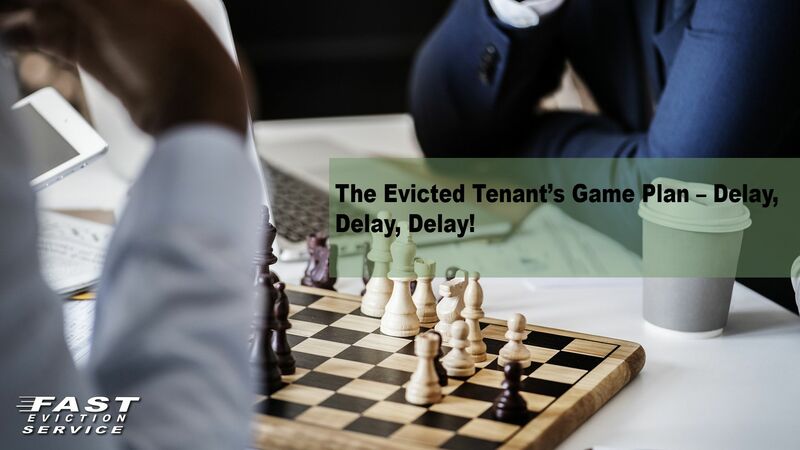 The Evicted Tenant’s Game Plan – Delay, Delay, Delay! Code of Civil Procedure §1161 was designed by the California Legislature to provide an inexpensive and expeditious legal way for a landlord to regain possession of the rental property when the tenant refuses to honor the rental agreement – or simply because the landlord needs to regain possession of the rental property. This rather simple statement of California Landlord/Tenant law over the years has become diluted by the delay tactics employed by tenants who want to contest the proceeding and stay in the rental property as long as possibly without paying rent. This article will the most common delay tactics tenants’ use in Unlawful Detainer cases and the response Fast Evict Law Group.Com would recommend to defeat these tactics and to regain control of the time line to get the tenant out. A Motion to Quash service of the Summons and Complaint is used by tenants to challenge the service of the Summons and Complaint. According to California Law the Motion to Quash must be filed within the allowed time to respond to the lawsuit – generally five to fifteen days depending on whether the lawsuit was served personally – by substitute service and/or by posting the order. The motion to quash must be set for hearing within five to seven days after it is filed. However, many times tenants and their paralegals or attorneys use the Motion to Quash improperly and set the hearing out for a longer period of time than the statute allows. To combat the Motion to Quash I recommend that the landlord file a written opposition setting forth how, when, where and on whom the Summons and Complaint was served. This opposition must include a Declaration from the person who served the Summons and Complaint. If the hearing on the Motion to Quash is set out longer than the statute allows it is also recommend that an Ex-parte Application to Advance the Hearing Date on the Motion to Quash be filed long with the Opposition to the Motion to Quash. This will require the tenant to come into court and explain to the judge why he/she filed the Motion to Quash and failed to follow the correct procedure for setting the hearing date. Many tenants and/or the tenants’ representatives will file a Demurrer or a Motion to Strike to simply delay the prosecution of the Unlawful Detainer case. Under California Law a Demurrer and Motion to Strike can be used to challenge the statements of the lawsuit if those statements do not meet certain legal standards. However, in the Unlawful Detainer case most lawsuits are filed using the forms provided by the Judicial Council of California, and if the correct statements are used the complaint will be deemed to be valid. The real purpose for the demurrer and/or the Motion to Strike as used by the tenant is to delay the ultimate result of the Unlawful Detainer case. An aggressive counter attack approach to a Demurrer and/or Motion to Strike must be used to obtain the quickest trial date to get the tenant out that the law allows. When faced with a Demurrer and/or a Motion to Strike the landlord must always use an Ex-parte Application to Advance the Hearing Date on the Demurrer/Motion to Strike and file the Opposition to the Demurrer/Motion to Strike at the same time. This will force the tenant into court to respond to the Ex-parte Application and to the Opposition to the Demurrer/Motion to Strike. If the tenant fails to appear most judges will grant the Ex-parte Application, overrule and/or deny the demurrer/motion to strike and most importantly may set the matter for trial within 10 to 20 days. These counter measures and recommendations are essential for successful landlording because it is always of utmost importance to remove a recalcitrant tenant from the rental property as soon as possible.